Amer Fort is rated as one of the top things to do in Jaipur. Its a must-visit place in Jaipur. Recently, Amer Fort has been listed as one of the 17 iconic tourist sites identified by the Ministry Of Tourism of India. Amer Fort is a UNESCO World Heritage Site and is a part of “Hill Forts of Rajasthan” cluster. People call it by many names like Amber Palace, Amer Ka Kila, Amber Fort and so on. Even though it is commonly called fort, in reality, it is a palace since it was a residential unit of the royal family. It takes 45 minutes to 90 minutes to complete a tour of Amer Fort. With so much to see and experience, this Amer Fort guide blog intends to help you plan your visit to the most popular fort in India. Expansive view of Jaleb Chowk with the Surajpol in the background towards the right side. I’m listing here sections of the fort in the order of importance. Ganesh Pol is the main entrance to the personal quarter of kings and queens. Only important people were allowed entry beyond this gate. It is incredibly beautiful and is one of the most photographed locations in Amer Fort. It’s a popular selfie point too. Pol refers to a gate in the local dialect. Ganesh Pol is the finest specimen of amalgamation of the Mughal and Rajput influences in creating a masterpiece. Named after Hindu God Ganesha, Ganesh Pol is symbolic of the importance Lord Ganesha has in the lives of people. As per Hindu belief, Ganesha’s blessing is sought before starting any auspicious work as he can help tide over any obstacles. It is common to find an idol of Ganesha placed at the entrance in Indian homes. Therefore it not surprising if this gate is dedicated to him as it leads to the residential area of the royal family. Tip: Do visit viewing deck above Ganesh Pol called Suhag Mandir. It has latticed windows used as a viewing deck by the royal women as they were not allowed to make a public appearance. Don’t miss the beautiful frescoes inspired by the Mughal influence on the wall. Mughal influence traces its roots to Central Asia in Bukhara, Uzbekistan. Diwan-e-Aam is a court where the king used to meet his administrative officials and appeared before important people during auspicious & important occasions. Built during the late 16th century, it features a beautiful amalgamation of two different architectural styles -Mughal and Rajput. Pillars in this hall are constructed using red sandstone as well as white marble. Elephant head and florally patterned vines are two distinct design elements to influence the design of pillars in this hall. Tip: You can have a panoramic view of Maota, Dilaram garden and Jaleb Chowk from Diwan-e-Aam. Diwan e Aam as seen from Jaleb Chowk, a courtyard meant for assembly of the army. Diwan-e-Khas or Sheesh Mahal at Amer Fort, Jaipur. Sheesh Mahal is considered as a “Jewel in the crown”. Diwan-e-Khaas means a place where the king would meet only close and important people. Sheesh Mahal refers to a section where walls and ceilings are covered with millions of small mirrors. Sheesh=mirror. During night these mirrors reflect light of a torch or wick, resembling stars in the sky. This technique of mirror work on walls and ceilings was popular during the reign of Mughal emperor Shah Jahan. The first specimen of Sheesh Mahal was created in Lahore fort which is now in Pakistan. Tip: Apart from the mirror work, don’t miss the fine inlay work on Makrana (white marble) in Diwan-e-Khas and the magic flower. The magic flower is carved in the marble slabs at the base of pillars in Diwan-e-Khas. You can easily recognize it as it has flowers, leaves, & butterflies hovering around it. This design contains 7 unique & distinct design elements -a scorpion, fishtail, a hooded cobra, a lotus flower, trunk of an elephant, a lion’s tail, and lastly cob corn. Truly, it’s a masterpiece; uncommon to find one these days. Sukh Mahal and The Mughal garden. Sukh Mahal or Sukh Mandir is just across Sheesh Mahal. It was a personal chamber of the king, it features a mechanism to keep the premises cool even during peak summer. Influences of Mughal architecture from the Jahangirian period can be found in the wall niches. Tip: The walls are covered with niches featuring Surahi/ vase pattern, a Mughal influence. Don’t miss the Char Bagh patterned Mughal garden between Sheesh Mahal and Sukh Mahal. Zenana= women. Zenana section has personal chambers of the queens and royal women. Some people call it a harem. The chambers were designed in a way that king finds his way to any of them discreetly to rule out a feeling of jealousy among the queens. Personal attendants of queens too lived in these chambers. Man Singh Mahal is not to be missed as it was constructed during the Mughal emperor Akbar’s visit to Amer and completed in 1599 AD. A stone slab is written in Farsi (Persian) having a message of Akbar adorns one of the walls here. A pavilion or Baradari can be found in the center of Man Singh Mahal. As per a popular legend, this pavilion was a meeting place for the queens. Amer tunnel was discovered recently as no one knew about its existence for years. You can walk through the Amer Fort tunnel to Jaigarh Fort. It was an escape route in case of an emergency, especially during a siege. It connects with Diwan e Aam, Man Singh Mahal, and Janana Deori. The Amer tunnel is subterraneous only to a point, afterward, it is roofless. 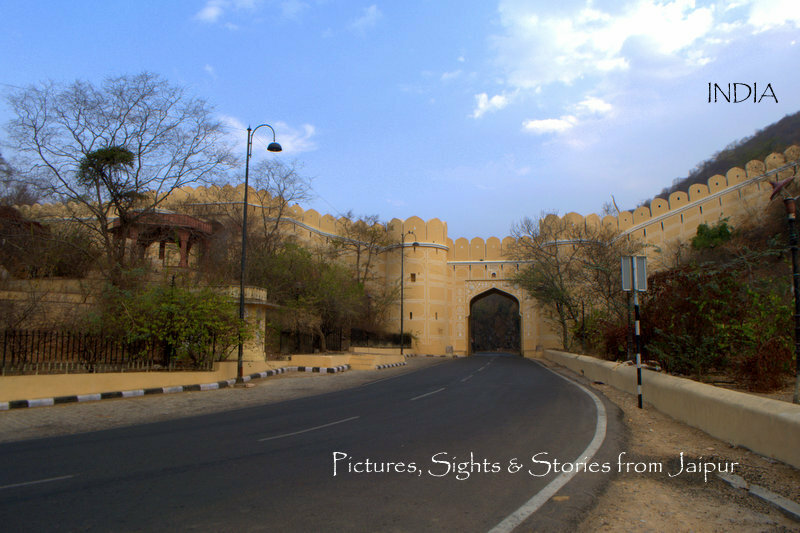 Tip: You need to plan for a pick-up at Jaigarh Fort if you wish to walk through Amer tunnel. Taxi/ Tuk-Tuk/ Auto-Rickshaw are not available on demand at Jaigarh Fort for your return journey. I have already written a lot about Amer fort elephant ride in 5 Reason why I love Amer Fort. Elephant ride in Jaipur is best experienced at Amer Fort. It is most sought after Amer experience. Elephant ride is available until 11 AM. Thereafter you can either use a golf cart or jeep ride to Amer Fort. Many people oppose the idea of using an elephant as it’s considered cruel. There have been many online petitions for animal cruelty against Amer Fort elephant rides. Personally, I don’t advocate any animal rides as I’m opposed to using animals for this purpose. I’ll let readers decide what is best for them. Currently, Elephant ride charge is Rs 1100 for one-way ride & seats two adults. Tip: Amer Fort elephant ride is numbered and available only till 11 AM. It is a big draw among the tourists & often there is a big queue before you can find your turn. It’s best to reach the elephant ride boarding point by 8 AM. Amer Fort electric vehicle golf ride costs Rs 40 one way. It is available from elephant boarding point to Jaleb Chowk -the main square in the fort. Sheela Mata temple has an interesting history. Maharajah Man Singh while fighting against the local king in Jessore, Bengal (now Bangladesh) in the 16th century could only secure the win after worshipping a local deity. He brought back the idol in a form of stone slab and installed it in Amer Fort. A custom of offering a goat sacrifice was followed for centuries but was abandoned in the later years. The ownership and management of this temple are retained by the descendants of the royal family while the government retains & manages the Amer Fort. The temple is made from Makrana White marbles, one of the best white marble in the world. Temple follows a strict policy of not allowing leather goods, shoes, socks, wallets, camera and mobile phones inside the temple. The sentry can be rude at times. Naqqarkahna can be found at Chandpole or west gate close to the elephant ride de-boarding point. Did you notice the drum on the upper deck of Chandpol gate? The musician would play a variety of music at Nakkarkhana using an array of musical instruments during ancient times. Out of these drums and Karna were the most prominent ones. The word Naqqar means drums also called Nakkara/ Nagada. Live music is played every morning using the old instruments to recreate an experience of a bygone era during the elephant rides. It is surely a unique Amer experience. Variety of ancient Indian instruments which formed part of Nakkar Khana at Amer Fort, Jaipur. Hamam or bath is one of the most overlooked section of Amer Fort. It’s an astonishing experience. I was surprised to learn how techniques were used for hot and cold bath experience in the days when technology was not available. The artisans in the ancient times were able to recreate what we experience today by channeling water and air flow. Hamman or bath was directly accessible from Sheesh Mahal. Although commonly referred to as Dilaram Bagh, it is actually Dil-Aaram Bagh. This garden is at a road level and one needs to walk through it to access the stairs to Amer Fort. The garden is patterned on Char Bagh design influenced by the Mughal style. There are beautiful pavilions on the left side towards Maota lake built in red sandstone. These pavilions are a great place to get your pictures clicked for the Instagram with a backdrop of beautiful Amer Fort. Irrespective of how you arrive at Amer Fort, Jaleb Chowk is where you alight. It is a huge courtyard where generals & soldiers congregated on all important occasions. The word Jaleb comes from the middle east and stands for a place where the soldiers assembled. Elephant ride ends in the north-west corner of this courtyard. There are only two ways to enter Jaleb Chowk – Surajpol Gate and Chandpol Gate. Dilaram Bagh can be covered either at the start of your visit or towards the end. Adds-on in Amer town should be covered later since the rush builds up after 9.30 AM in the fort. Here is a guide map for Amer Fort with the layout. There are many things which can be clubbed up with your Amer visit. Here are a few places and experiences that can be added to make it a more compelling trip. This is a great way to explore the secrets of Amer Fort which are not accessible for the tourist. This heritage water walk needs to be booked in advance as it is conducted by a water expert and not available for the walk-ins. You still need to buy a entrance ticket for Amer Fort therefore it is best to club it with your Amer Fort visit. The walk takes 1.5-2 hours and takes you through the hidden areas of Amer Fort. Read How to explore the secrets of Amert Fort with Heritage Water Walk? Jagat Shiromani Temple is one of its kind. Masterpiece. The temple has beautiful carvings and is built using a variety of stones. There is an interesting story as to why this was constructed. You can find the complete details in my post on Jagat Shiromani Temple. The museum is set in an old restored haveli. Anokhi is a commercial enterprise engaged in the business of selling hand block printed garments. Many people consider this museum as a sales promotion tactic, aimed at generating leads to their outlet in the city. There was a big uproar a few years ago when this old haveli was sold to this organization. But all that is settled now. You can visit the Anokhi museum to explore the history of organic hand block printed fabric for which Jaipur is famous. It is another thing that finding organic colors is difficult now as everyone has switched to synthetic colors for the lure of mass production and greater profits. Check out my previous post on 5 Reason why I love Amer Fort. Travel Tips for Amer Fort. Amer Fort is open from 8 AM- 5.30 PM and is part of Jaipur Night tourism programme, Amer Fort by Night. Amer Fort can be visited from 6.30 PM to 9.15 PM under the night tourism scheme – Jaipur By Nite. Sheesh Mahal during Amer Fort By Night. Amer Fort is 11 km from Johari Bazar; a driving distance of 20 minutes. During a heavy rush, it stretches to 45 minutes. The cheapest way to reach Amer Fort is via low-floor bus which can be boarded at Badi Chaupar near Hawa Mahal. Other options include hiring a tuk-tuk/autorickshaw and a taxi. Finding a taxi or auto-rickshaw/tuk-tuk from Amer to Jaipur is not difficult. You can also use UBER or Ola app for hiring a taxi. Amer Fort Entry ticket is priced at Rs 100 for Indian visitor, Rs 500 for a foreign visitor, Rs 100 for foreign students, and Rs 10 for Indian students ( student/ school identity card is mandatory for availing subsidized price). There are two options for parking your car in Amer Fort. First one is opposite to the fort on the main road near elephant ride boarding point. There is a small privately managed parking lot where you can park your car. It is difficult to find space here during the high season. If you choose to park here then you can hire a jeep to take you to the fort entrance. Other options to reach Amer Fort includes walking through the staircase, elephant ride, and golf cart. The second option is to drive your car to the parking lot behind the Amer Fort. You need to drive through the lanes of Amer town to reach this parking lot. The advantage is that you get to reach the fort directly. Do note that during the high season finding a parking spot becomes difficult. The trick is to park furthest to avoid a traffic jam. The parking charges are reasonable as compared to the one on the main road. If you love exploring the history of Amer Fort, don’t miss Amer Light and Sound Show which takes place every evening near Kesar Kyari in Maota lake, Amer. This show runs in two editions – Hindi and English. Kesar Kyari, at Maota lake, the venue for Amer Lights and Sound show. It is being claimed that years ago Kesar or saffron was grown in this garden. The logic for having this garden in the middle of a lake is that water helped create a suitable climate to grow Kesar. As such Jaipur or Rajasthan doesn’t have conducive weather conditions for growing saffron. The only place where saffron is cultivated on a big scale in India is Kashmir. It is likely that the idea of growing saffron in Jaipur came into being during the conquest missions of Raja Man Singh I who fought for the Mughals till Persian borders. We really have no clue whether they were successful in growing saffron or not. All we are left with is the name – Kesar Kyari. Currently, assorted plants have been planted here. It’s best to hire an approved guide or an audio guide when you visit Amer Fort. Without context and information, you probably won’t enjoy your visit to Amer Fort. Official guides charge Rs 200 to Rs 500 for a tour. Do not fall for the tourist trap and scam popular in Jaipur in the name of a “Factory visit” or a “Museum tour”. Guides and drivers lure the tourists in tourist shops & emporiums and earn hefty commissions. Stay clear of any sweet sounding deals. Amer road is full of such “tourist traps”. Vendors luring tourists with their wares. If you love touristy experiences you can try an upmarket restaurant in Amer Fort – 1165 AD near Shila Mata temple. Apart from this, there’s café coffee day outlet near the exit gate. It’s a bit shabby but popular among the tourists. The best place to enjoy your coffee is the one overlooking Jaigarh Fort and Amer town from the seating area right behind the cafe. The best place to enjoy your coffee is with this view at outdoor seating are in Cafe Coffee Day. Sadly, there aren’t many good options to eat near Amer Fort. There’s a Cafe Coffee Day outlet near Elephant stand, Stag cafe, and a few local Dhabas on the main road but none of them are worth talking about. If you are fine with eating at a local Dhaba (read – in a run down condition) you can try Jagdamba on the main Amer road opposite to Dilaram Bagh entrance. This Dhaba still uses old-age methods of cooking on a coal oven. The food is neither very spicy nor greasy, unlike most Dhabas. It is a pocket-friendly place. Strictly for Indian food lovers only. When to avoid visiting Amer Fort? Amer Fort being a popular attraction attracts a large number of visitors and can get extremely crowded at times. It is best not to visit during a long weekend. Also, it can be very crowded during Navratras because of the large number of devotees visiting Sheela Mata temple. At times, tourist entry to Amer Fort is also closed because of the rush. The beauty of Amer Fort can neither be described in words nor by pictures. You’ve got to experience it in person. I am quite interested to join the next walk to Amer. Will greatly appreciate if you share details and dates.